I have no specific info for this disc. 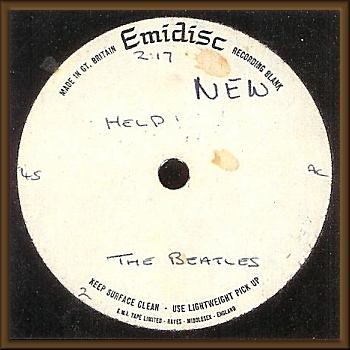 A recording of a "Help" acetate with an alternate vocal, allegedly for the film production, circulates among collectors but there is no indication if that is this disc. RM2-4 on 18 April. Lewisohn says the mixes were intended for United Artists. Winn speculates, per Barrett, that the available acetate recording is RM4 from 18 April. Winn then goes on to speculate that an undocumented session took place(between April and June) where John redid the vocal which was featured on the released single and mono LP. The stereo mix used the original take 12 vocal. It seem possible that the disc seen here could be RM1? from 13 April, RM4a from 18 April, or a mix (RM4b) from the undocumented session.